All ages; birth to infinity. To write this review, I borrowed a copy from my local public library. I am writing this review on the morning after a nasty snowstorm that caused massive power outages here in the Northeast. It was difficult waking up to a very cold house, no hot water, and realizing that though I could turn on the gas stove we couldn’t control the thermostat…that part is electric! 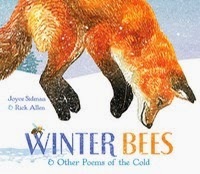 But once the sun came up, I was comforted by the marvelous poems from Winter Bees & Other Poems of the Cold. I’ve been a huge fan of Joyce Sidman for years. I often recite at the top of my lungs while cycling to work the "Backswimmer’s Refrain" from, Song of the Water Boatman and Other Pond Poems. I also had the privilege of serving on the 2011 John J. Newbery Committee that selected Dark Emperor & Other Poems of the Night as an honor book. I love that Sidman’s poetry is about nature. Winter Bees &Other Poems of the Cold opens with winter arriving with the first snowfall when the Tundra Swan knows it is time to head south and ends with the fist-size bud of the skunk cabbage. Skunk cabbage peeks up though the snow/the first flower of the wood. I’m a big brown moose/I’m a rascally moose, /I’m a moose with a tough, shaggy hide;/and I kick and I prance/in a long-legged dance/with my moose-mama close by my side. If I had to select one poem as my favorite, I’d pick “Snake’s Lullaby.” In the sidebar there is an explanation that snakes hibernate (brumate) in large groups underground during the winter. Most return to the same "hibernaculum" year after year, using their tongues to smell their way along age-old paths. Rick Allen’s artwork perfectly captures the essence of each poem. His illustrations were created by cutting, inking, and printing from linoleum blocks (nearly two hundred of them) and then hand-colored them. The blocks were then digitally scanned, composed, and layered. Besides being absolutely beautiful, both in composition and the colors used, they are also playful. P.S. Can you find the fox, or its footprints, on every page?